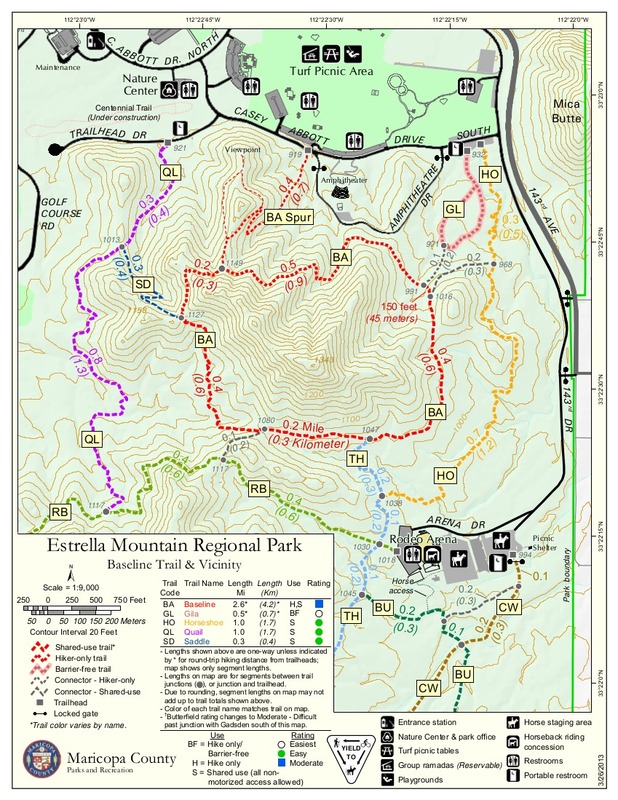 Estrella Mountain Regional Park is located about 20 miles west and south of Phoenix in the foothills of the Estrella Mountains. It was established in 1954 with the purchase of 800 acres. Today, the Estrella Park stretches for almost 20,000 acres. It has a wide range of amenities including horseback riding, a rodeo arena, golfing, fishing, baseball diamonds, a 65 acre grass picnic area and trails for hiking and biking. 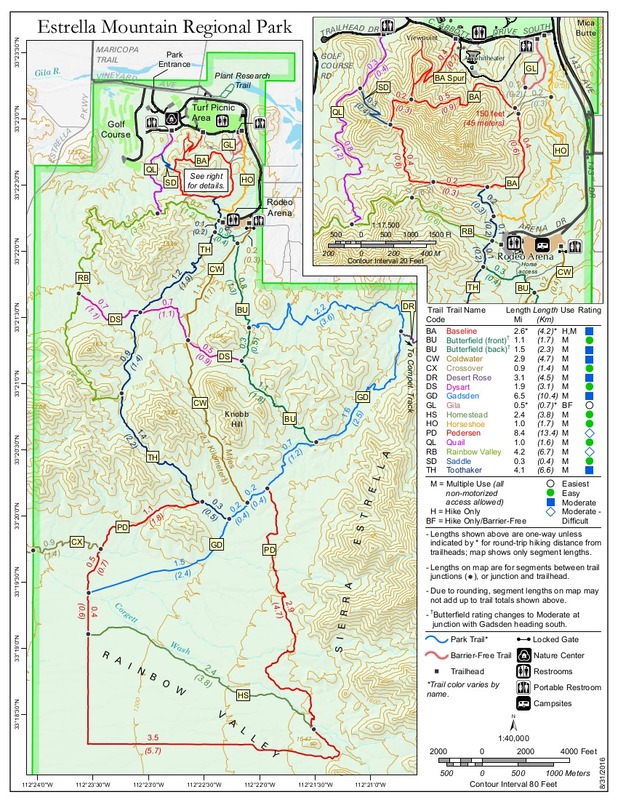 The park has 14 trails that extend for 36 miles into the Park. The hike starts from same parking area as the Gila Trail. 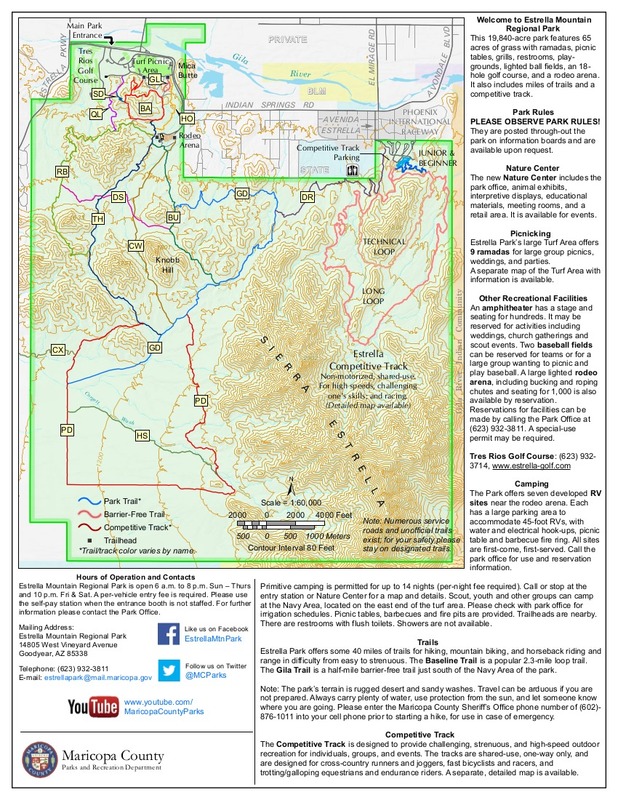 The trail head for the Horseshoe Trail is about 20 yards further east than the Gila and is signed. The trail is very easy to follow and starts off with very little elevation gain as it twists and turns negotiating several washes. At 0.25 miles the trail will start a slow climb (only about 80 ft total) as it starts to hug the east side of a hill. As this climb starts (at about 0.29 miles) there is a signed juncture with the Baseline Trail Connector. Continuing on the Horseshoe Trail you'll reach a high point at 0.48 miles as the trail wraps around the hill and starts a gradual descent. The views from this spot are not great, but you can see a bit of the Gila River, PIR track and downtown Phoenix. You also get your first look at the rodeo arena from this trail. The descent is minimal and only for 0.2 miles. The trail then does some weaving as it negotiates three minor washes and then begins another gradual climb and westward swing. At 1.02 miles the trail ends at its point (1025 ft, 110 ft higher than when you started) at the Toothaker Trail. You have numerous options at this point. You can return the way you came for an easy in and out hike (round trip 2 miles) or you can take the Toothaker Trail north or south and create a loop of your own devising. There are park maps available when you enter the park that will allow you to see how they all interconnect. This is a great trail for beginners or for someone who is looking for a "quickie". There are other trail heads that get you closer to the interior of the park, but if you are looking to do a combo hike (multiple trails), with miles, this is a nice way to tack on some mileage. There is no water at this trail head, though if you continue on the Toothaker the rodeo arena does have a drinking fountain and bathrooms. There is also a port a pot at the Horseshoe trail head. To hike From central Phoenix head west on I-10 towards California. Take the Estrella Parkway exit and head south. Continue about four miles or so to West Vineyard Avenue. Turn left on Vineyard, you'll pass a golf course. Keep your eyes peeled for the right turn into the park soon after the golf course. Take Casey Abbot Dr. and follow it around the perimeter of the park. This will eventually turn into 143 Dr. as it heads south. Within 0.2 miles turn right on Casey Abbott Rd. The parking area for the Horseshoe Trail is immediately on the left.